Which Racing Suits Are The Best? Of course, this is a controversial subject. Especially considering how many phenomenal independent brands there are in the industry. But most of us are looking for the basic, recognizable brand name products that we can feel confident in, while not spending a lot of time and money in making a decision. Each of these companies has an established reputation in the industry, whether it be centered around performance, quality, value, or any combination of the three. Sparco, Impact, Alpinestars, and Oakley are known as the high-end players. They offer very high-quality suits, with impeccable performance, and a lofty price to match. Of course, they each offer their own mid-range suits that are more affordable. Bell is a favorite all-around company. Great products for reasonable prices! K-1 specializes in high quality Karting Suits. Oakley is fairly new to the industry, but they have been designing some phenomenal products, including their firesuits. They are not cheap, but they are quality. And soon they will likely rise to the status of Sparco and friends. In fact, Sparco has helped subcontract Oakley’s line! Not a bad company to get some help from. Recently oakley racing shoes have become prominent in several major racing series including NASCAR and Indy. And then G-Force and RaceQuip are the two value brands. They don’t have the curb appeal of the more expensive suits, but they certainly get the job done, and for a lot less money! G-Force has been around a bit longer than RaceQuip, and has grown immensely in popularity and recognition. But RaceQuip is slowly moving into their territory. RaceQuip’s competitive advantage is higher manufacturing quality at an even lower price than G-Force! Honestly, it would be no surprise if in the next few years, RaceQuip’s prices go up as they gain a reputation for such great value. Most RaceQuip dealers are already begging the sales executives to raise MSRP because they know customers will pay it. Ultimately, it is great for all of us that there is some new, bold competition out there for this segment of the market. The more competition, the more affordable the products will become. And, we will get more for our money! There are certainly a lot of options out there, and these are just a few. But if you take a little time to figure out what “type” of suit you need, you will be in a good starting position. If you want to take the time to look through smaller independent companies, there is certainly nothing wrong with that. But you can certainly save yourself some time by sticking with one of the brands above – they won’t steer you wrong! Each type of track has its own character as far as the conditions experienced by the racer. Therefore, it makes sense that each type of track would warrant a specific type of racing suit. For example, just as auto, motorcycle, and karting have their styles of suits, so do dirt and pavement tracks. On a paved track, there are few concerns regarding the condition of the track. So long as there are no major wrecks, debris is generally at a minimum. In regards to motorcycle racers, paved tracks are especially different in that they are not constantly kicking up dirt, clay, and chunks of debris in general. On a dirt track, however, the circumstances are reversed. All kinds of debris are flying around, making contact with you during your race. Often times, the track is also wet, presenting a completely new issue: Waterproofing. Dirt track suits and some motorcycle/motoX suits are designed with waterproofing in mind. The last thing you want while you are racing around a track is your suit filling up with water. First of all, that would be very uncomfortable. Second, it would add a lot of weight. Third, it would raise your center of gravity. And forth, it would cause your suit (which is an investment) to deteriorate much faster. 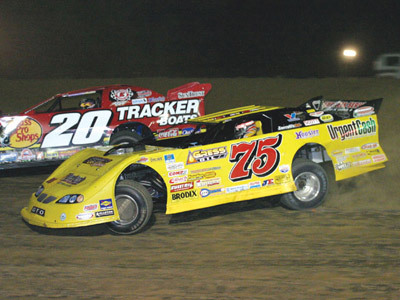 Therefore, it is easy to see why manufacturers have designed waterproof suits for dirt track racing. What Do All The Ratings Mean? SFI Ratings are determined by the results of several tests conducted on racing suits for fire retardant capabilities and Thermal Protective Performance (TPP). The standard spec for racing suits is 3.2A, or 3.2A/1. Superior construction will yield ratings of 3.2A/3, and 3.2A/5. The increasing last digit indicates an increase in the length of time you will be protected by your firesuit before it succumbs to the flames. What does this mean to you, the consumer? It means that you have a way to differentiate between quality-assured products and untested products. A driver suit that is certified to meet SFI spec has been laboratory tested and has passed the requirements of the tests. Those manufacturers who certify their products as SFI approved demonstrate their commitment to providing the highest levels of safety for their customers. It is important to understand that SFI Rating do NOT represent the number of fabric layers in the garment. Other tests conducted to determine SFI rated suits are the After-Flame test (indicates how long the garment material takes to self-extinguish following the application of a direct flame), Thread Heat Resistance, Zipper Heat Resistance, and Multiple Layer Thermal Shrinkage. The Snell Memorial Foundation (SMF) is a non-profit organization dedicated to the research, education, testing, and development of helmet safety standards. Each segment of racing vehicles has its own Snell Standard Rating. On our website, the standards you will encounter are related to automotive (SA2005 or SA2010), kart (K2005 or K2010), and motorcycle racing (M2005 or M2010). Ratings are determined by a battery of tests conducted in SMF’s state-of-the-art testing facility. Included are test for Impact, Positional Stability, Dynamic Retention, Faceshield Penetration, Flame Resistance, etc. What does this mean to you, the consumer? It means that you have a way to differentiate between quality-assured products and untested products. Racing helmets or karting helmets (even snowmobile helmets!) that are certified to meet Snell standards have been laboratory tested and have passed the requirements of the tests. Those manufacturers who certify their products as Snell approved demonstrate their commitment to providing the highest levels of safety for their customers. TÜV SÜD AG is a leading technical service company active in the Industry, Product and Transport sectors. Its range of services encompasses consultancy, inspections, tests and expert opinions, as well as, certification and training. Its objectives are reliability, safety and quality, as well as environmental protection and cost effectiveness. The company partners with leading industry manufacturers in numerous areas related to safety, internal manufacturing processes and product quality, and codes/standards development. They perform research, testing and certification for nearly every part of a vehicle imaginable, from tires to electronics to glass, plastics, fabrics and engines. Products sporting the “TUV Homologated” stamp ensure that you, the consumer, will receive and experience premium performance via quality and safety. Since its birth in 1904, the Fédération Internationale de l’Automobile (FIA), has been dedicated to representing the interests of motoring organizations and motor car users throughout the world. It is also the governing body of motorsports worldwide. This combination of road and track gives the FIA a unique responsibility as an independent world body concerned with a wide range of automotive, motoring and mobility issues. The FIA is a non-profit association which brings together 222 national motoring organizations from 130 countries on five continents. Its member clubs represent over 100 million motorists and their families. This is a powerful mandate which the FIA is proud to defend. On issues such as safety, mobility, the environment and consumer law the FIA actively promotes the interests of motorists at the United Nations, within the European Union and other international bodies. Products sporting the “FIA Homologated” stamp ensure that you, the consumer, will receive and experience the premium performance, quality, and safety afforded by contributions from FIA’s global network of interested and pro-active members to affiliated manufacturers. The CE mark certifies that a product has met European Union health, safety, and environmental requirements, which ensure consumer safety. By affixing the CE marking, the manufacturer, its authorized representative, or person placing the product on the market or putting it into service asserts that the item meets all the essential requirements of the relevant European Directive(s). So, if you happen to live in Europe, you may rest assured that any product stamped with this mark is deemed safe according to your governing region’s standards and requirements for public health and safety. A lot of motorcycle and snowmobile gear will carry this designation. It is not uncommon for customers to assume they know what size they need. All their life, they have been getting accustomed to their body, and how clothes fit. But most of us have never tried on a racing suit before, so what are the chances we know what size we need without referencing a sizing chart? Probably the most ignored aspect of racing suit sizing is that the suit is not supposed to fit perfectly when you are standing up, but rather while you are in the driving position. When you take your measurements, you want to be sure that the way you take them coincides with the way your sizing chart instructs you to. Some sizing charts will recommend that you take them while standing up. Others will recommend taking them while sitting down. And almost all of them will recommend you have someone else take the measurements for you, to ensure accuracy. 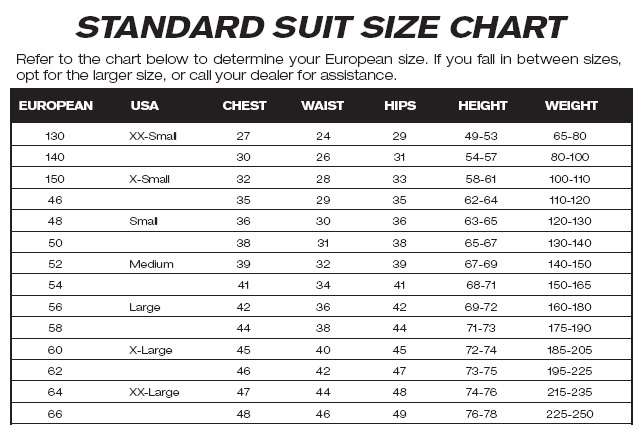 So, why the fuss about using a sizing chart? Because it will make everything so much easier for you, from the ordering process to the track. Let’s face it, one of the most difficult parts about buying anything online is that you cannot tell if it fits. Then why not use a sizing chart if it is available. It will save you and your retailer a huge potential headache! And honestly, it will probably save you some money too, as most retailers will charge a restocking fee on such items, plus the return shipping cost. Beyond the ordering process, it is also imperative that your suit fit properly so you can drive or ride comfortably, which equals additional safety. When you are uncomfortable, your concentration falters. And when your concentration falters on the track, you are putting yourself and everyone else on the track at risk. The last barrier to customers using sizing charts is the complicated numbers and metrics. Sometimes the same brand will use both inches and centimeters on its sizing charts. There isn’t a great way around this, other than to simply encourage you to pay close attention when you are reading the instructions, and make sure you use the right metric. Essentially, it is a good idea to make use of the resources that are provided to you. If a retailer has had the foresight to provide you with a sizing chart, take advantage of it! They are trying to do you a favor! And if you can’t understand it, send their customer service team an email, or give them a call. They would much rather help you figure it out before you place your order, then after you have received it and discover it doesn’t fit. Deciding how many layers you need in your racing suit presents a common misconception: That multi-layer suits are inherently safer than single-layer suits. It may seem surprising, but this is not always true. It all comes back to what materials are being utilized in the suit. Is it Proban, Nomex, Carbon-X, etc.? Proban is commonly applied in economy suits due to its cotton base. The cotton fabric is impregnated with a chemical cocktail that initiates polymer formation that is irreversible. This polymer formation is the barrier that protects you from fire and intense heat. However, many racers and product specialists believe Proban to be lacking in longevity and prolonged protection. Nomex, on the other hand, is the next most widely used material in fire suits. It is known for being far more consistent, durable, long-lasting, and protective. Nomex is trademarked product manufactured by DuPont. It is a meta-aramid material. So getting back to the original question: Which is better – Single-Layer or Multi-Layer? Well, a single layer Nomex suit would actually stand a good chance at outperforming a multi-layer Proban suit – especially if both suits had already been through some wear. Ultimately, a multi-layer suit will provide you additional layers of protection, which is why professional racers and some leading amateur racing sanctioning bodies require a multi-layer suit that meets specific SFI and FIA ratings. But, not all of us are professional racers or even amateurs. And we all certainly cannot spend the same amount of money on racing suits that professional racers can. Most of us are just looking for what it will take to keep us safe, and the rest is simply luxury! In that case, the best thing you can do is determine your budget, and try to find the best suit for your buck. It may be a high-end single-layer suit made out of Nomex. Or maybe a multi-layer Proban suit is your best option. No matter what, keep in mind that having a suit is better than not having a suit. Even if it’s single-layer Proban, it is certainly better than absolutely nothing. Just like there are different styles of men’s and women’s dress suits, there are different styles of racing suits. The primary difference is that auto suits are fire retardant/resistant and motorcycle/kart suits are abrasion resistant. In auto racing, you have a higher risk of being involved in a fire. Of course, because you will be inside an enclosed vehicle, hopefully harnessed in, if you are in a fire, you will likely be exposed to it for a considerable amount of time. Therefore, the focus of design on an auto suit is protection from fire. But motorcycle and kart racers are susceptible to very different dangers. In motorcycle racing, the racer is at high risk of a high speed bail-out or simply losing control, which will result in sliding across pavement, gravel, grass, barrier walls, or even impacting with another bike. In karting, you are in an open cockpit vehicle, experiencing very high g’s, very high speeds, and very sharp corners that can lead to being ejected from the vehicle, or on occasion, being dragged along the pavement or side-walls. Keep in mind, these dangers are rarely encountered, but they are real dangers nonetheless, and serious enough to protect yourself just in case. Because fire exposure is far less of an issue in motorcycle and karting, the focus is centered on abrasion resistance – the paramount danger and concern. You can also identify some subtle differences between the two styles in regards to fitting, cuff design, shoulder gussets, etc. Primarily, kart racers understand that space in the cockpit is slim. You can’t expect to wear a baggy suit and be comfortable, much less be able to perform competitively. Karting Suits are designed with spatial consciousness in mind, which ultimately leads to a better experience for the individual wearing the suit. Moto-specific suits are also tailor-trimmed, but for different reasons. Aerodynamics play a key role in all types of racing, but especially in motorcycle racing. Riders tend to be of small frame, so they can fit behind the façade of the bike. But the size of the rider matters little if the rider’s protective gear negates it. 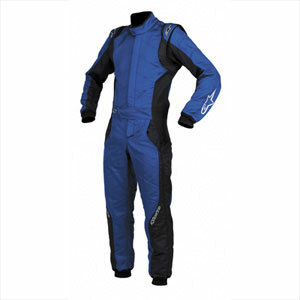 Therefore, manufacturers design motorcycle suits to be streamlined and form-fitting, while simultaneously protective. Snowmobile suits share many of these inherent characteristics, but also integrate insulation as well as a waterproof external shell. Snowmobile clothing also needs the be breathable and, like motorcycle wear, needs reflective piping. Auto suits, being focused on fire protection, are designed to ensure you are never exposed to a fire. This is fairly easy to accomplish in light of the fact that space is not of paramount concern for most auto racers. The foot wells and cockpit area of most automobiles are spacious enough that no considerable limitations are imposed on manufacturers. Ultimately, if you know you’ll be auto racing, buy auto racing suits. And the same applies to those who know they will be motorcycle or kart racing. After all, that’s what they are made for! Just because they are all “Racing Suits,” that doesn’t mean they will protect you in the same ways. And never ever choose a suit solely based on its appearance. If you are going to spend the money, buy something that will actually benefit you in a way that actually counts! Does My Racing Club Require Specific Safety Ratings and Certifications? Most clubs have certain safety racing gear standards and requirements. They vary from group to group, but it is always a good idea to find out what these standards are before you start shopping – it will save you a lot of time and hassle. Many customers do not realize the benefit of choosing a 1-Piece racing suit over a 2-Piece suit, and vice versa. It could be the difference between your comfort/safety and discomfort/danger. A properly fitting suit allows for uninhibited motion while in the driving position, and fits comfortably around the majority of the entire body. Keep in mind, most manufacturers design their suits similarly to clothing designers – with the “normal” body type as the keystone for every size and measurement. However, as many of us know, the “normal” body type isn’t always what fits. We all have our own proportions, and sometimes a 1-Piece racing suit just won’t accommodate us properly. And that’s the beauty of a 2 Piece suit! It allows for more flexibility and versatility. Suppose I have a very broad chest and shoulders, small waist, and short height. These proportions could very easily fall outside of the “normal” body type measurements/proportions. If I proceeded with a 1 Piece suit, I would have to disregard at least one of my core measurements – most likely height. The large chest and broad shoulders are common for taller men, the small waist for shorter/thinner men, and the short height matches the smaller waist, but not the large chest and broad shoulders. But, if I proceeded with a 2-Piece racing suit, I could select the racing jacket size for my specific build, and then do the same for my pants. Often times, we find that our body types are not streamlined from top-to-bottom, and switching to a 2 Piece suit allows for more “fitting” options that are better “suited” to you. In the end, it all comes down to safety. A comfortable driver is a safer driver. And a safer driver means a safer field of drivers. Also, a properly fitting suit is more effective in terms of protecting you from fire. So, if you are looking for a racing suit, and find yourself struggling to match up your measurements with “standard” 1 Piece suit measurements, you may be the perfect candidate for a 2 Piece suit!